A high quality Jasmine Green Tea made by layering tea leaves with fresh jasmine flowers at least three times, removing and adding fresh flowers each time. 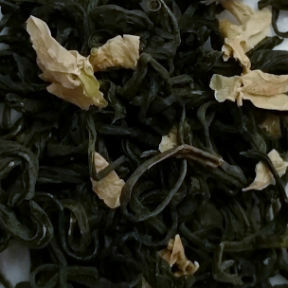 The result is a delightfully scented tea that retains its flavor after multiple infusions. Cheap, commercial scented teas are often sprayed with jasmine-scented sprays that disappear after one infusion. Rich, but not overpowering.